We had a cold Halloween this year - Brrrr! 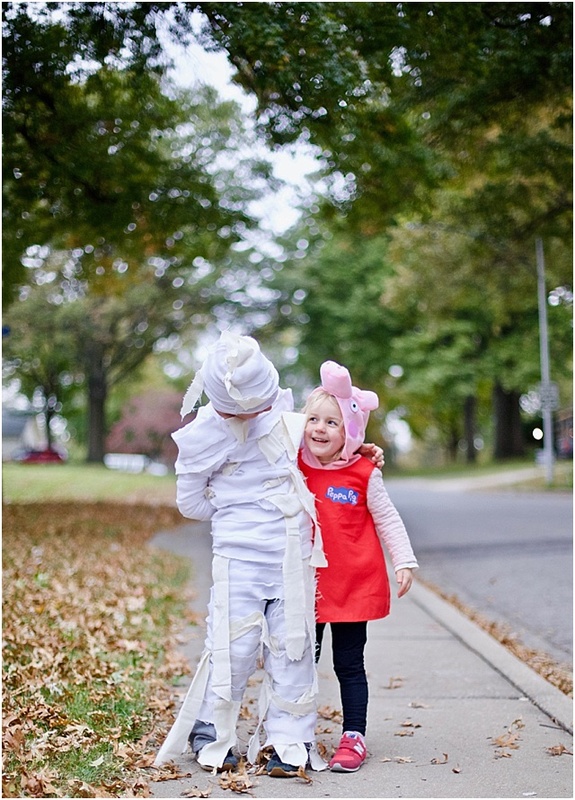 But thankfully, both kid's costumes were adaptable. And actually, Liam's would have been way too warm if it were a warmer day. 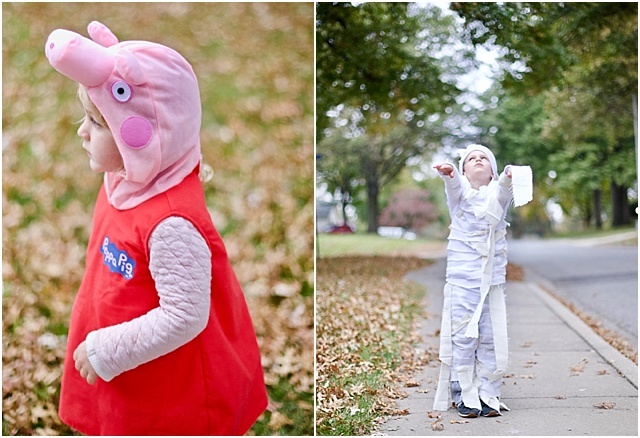 The drama that is deciding on (and maintaining that decision) Halloween costumes when you're almost 4 and 6 is real. Liam had all sorts of ideas, different each day, but then decided to be a ghost. 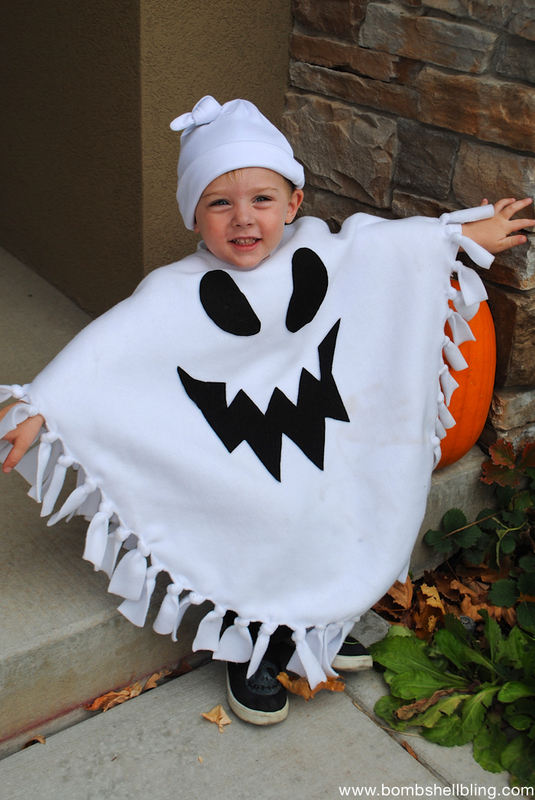 After finding a ghost costume DIY idea that didn't go over his head (ya know, for better class party/costume wearing), we ordered the white fleece fabric, white beanie, fabric glue and back fabric for the ghost face. Upon receiving the materials, we showed Liam the inspiration piece - and he was mad. No more ghost - way too baby-ish he said. 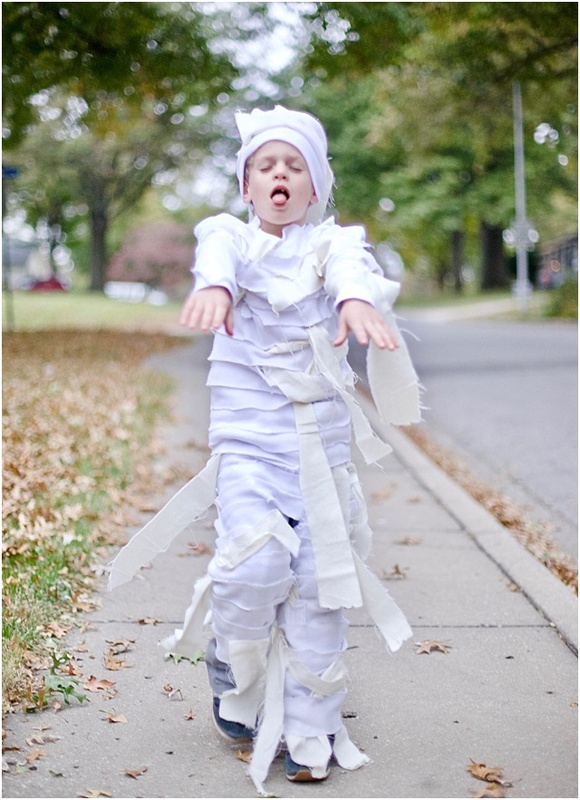 So, after a week thinking, we came up with the mummy idea this past weekend because we could use most of the same materials we already had for the ghost. We took the white fleece fabric and cut into strips, using safety pins to adhere to the top of the pants/shirt and then using fabric glue to adhere the fleece strips to each other (as to not damage the clothes), wrapping around the base-clothing. 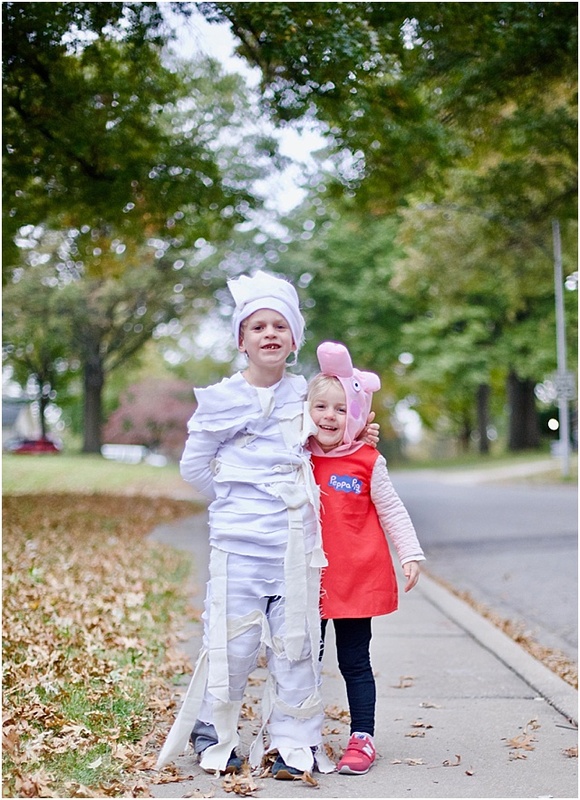 I used safety pins to keep the mummy layer fixed to the clothing. We then added some strips of canvas (a new purchase) to let hang and switch up the coloring. 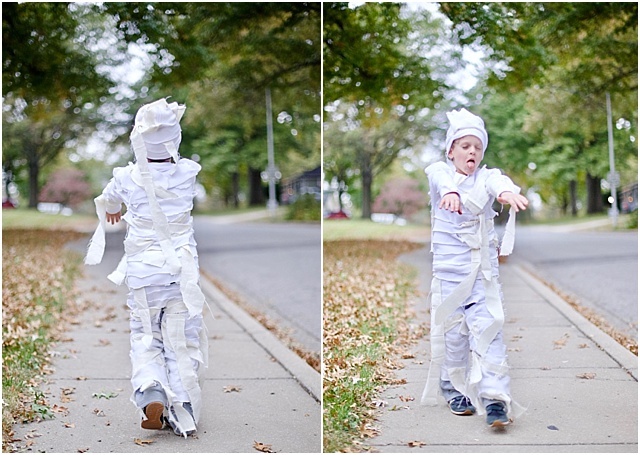 Thus, the super warm mummy outfit - it's sweat pants and a shirt layered in all those fleece strips! 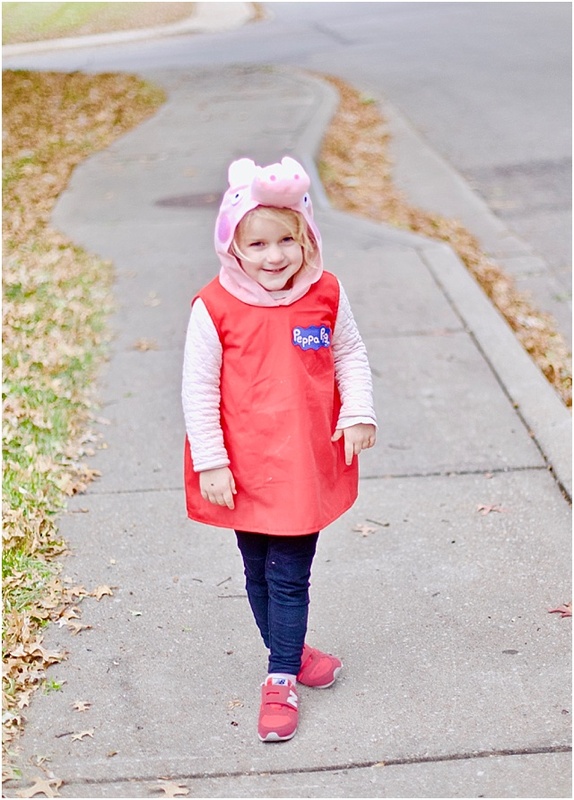 And Nora - she actually was consistently Peppa Pig that last month despite NEVER watching that show! I was so surprised that was her decision (and even tried to talk her out of it) - she must have been influenced at school or something. haha! But I admire her tenacity. We had a fun night trick-or-treating with neighbors/friends! 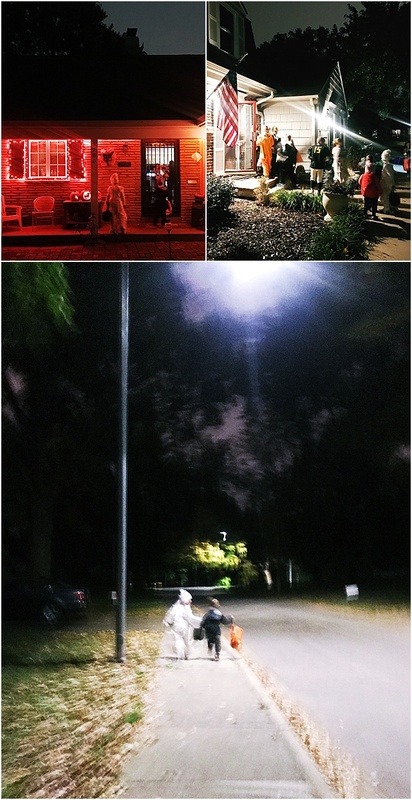 The boys (Liam and his friend, Paul) were sprinting ahead, racing from one house to the next. It was good, keeping up with them all kept us a bit warmer. Hope you all had a great Halloween!